Whether the service is for accounting, marketing, or any other outsourced business function, managing client expectations and giving proof of value is an essential part of the package. While frequent reports are an essential part of client management, more and more businesses require customers to log into an online service to manage their own data. As a result, companies are outsourcing their customer data management to external online dashboard providers. However, giving multiple clients access to their data can be time-consuming and difficult to manage. To effectively manage your clients’ access to data, some features exist which make the process much easier and less stressful. This article will show you the 5 most important features which your dashboard software should have for customer management. If you manage multiple clients who regularly access your online service, there are a few rules which have to be adhered to. 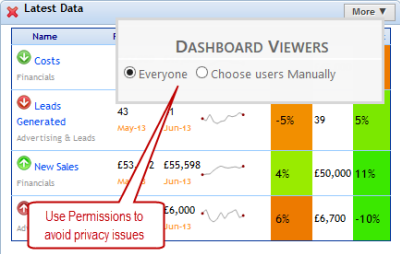 Therefore, it is important for your service dashboards to be able to grant different levels of permission to users. These will block off data from users who have nothing to do with it. In a program such as Target Dashboard, if a user doesn’t have permissions to a particular data set, they simply cannot see it or access it at all. This gives security to other clients. While the second rule (above) mostly relies on a having a reliable system which won’t store or chart the data inaccurately, data can become inaccurate when it is accessed by multiple users from the same company who change data without their colleague’s knowledge. This can lead to inaccurate figures. Permissions allow dashboard admins to let certain users see data, but not edit it. This lets your clients work in full confidence that their data is accurate. When businesses run software as a service (SaaS), clients will not want to log into the service, and then log in again to access their dashboards; this makes the service slow and tedious to use. This can be prevented by using a single sign-on service. As the name suggests, using a single sign on service lets you log into multiple user accounts for online services at once. Logging into the online service and dashboard service simultaneously makes the service dashboard appear to be integrated with the actual SaaS. This is more practical for clients, and makes the business SaaS less jarring to users. Sometimes, clients need to be able to share data with their own stakeholders or employees, so that they can make their own decisions and take action. 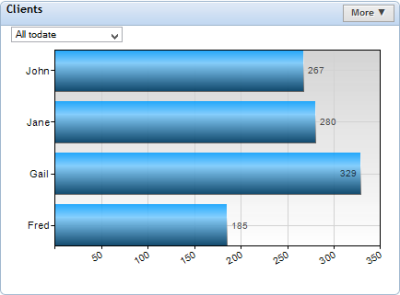 Chart Embedding allows clients to display their data on their own online communications (website, intranet). This also lets others see the value that your SaaS brings them. One of the main advantages that chart embedding gives clients is the ability to manage their external data charts from one source. If a client simply recreates an image of a chart to show on their website, this will quickly become out of date. However, embedding a chart still keeps it live; if the chart is updated in the original dashboard, the embedded chart updates along with it. To make the transition between the business software and client dashboards more seamless, dashboard software should give admins the option to customize the layout and appearance of their dashboards to their own specifications. Because there is an abundance of online applications to choose from, branding plays a part in why people choose your offering, as your brand represents to people your core values, such as reliability or safety. Therefore, changing the aesthetics of your dashboards to reflect your own software is a great way to give customers confidence in you and your service. A key point to remember for customisation is that less is more. For example, Target Dashboard allows you to customize logos, chart windows and fonts (amongst other things). These may seem simple, but they can be all that’s needed to improve a client’s user experience. Editing each of these with your own logo, primary brand color and a font similar to the one used on your service goes a long way to making your client feel right at home. The most important feature that a client dashboard program should have is an easy to use interface. If you manage multiple clients, teaching them all how to use a complex dashboard system designed for IT experts is going to be next to impossible. Therefore, the ideal dashboard solution is one that is easy to use, yet does not sacrifice this for analytical power. A lower learning curve will also mean that the adoption time for your product will be significantly reduced. Choosing dashboard software for client use can be very different to choosing it for internal use. When assessing ease of use, it is best to think of what analysis your clients will need to do, then shop around to test these functions on different dashboard programs. Concentrating on the features your clients need (rather than everything) will let you find the best service dashboards for your client’s needs. Allowing clients to access and edit data from your online service usually requires an external dashboard program (unless you have the skills to make and manage your own). However, not all dashboard software is built for handling clients, and some features are essential to have. This article has shown you 5 important features which you should consider when evaluating dashboards for client use. If you are currently looking to implement dashboard software for clients, Target Dashboard could be the best option for you and your clients! Just email us for more information, or sign up for a completely free trial now!